I am pleased to announce that we were able to acquire an early edition of Five hundreth pointes of good husbandrie by Thomas Tusser at the Rothamsted Collection/Lawes Agricultural Library auction at Forum Auctions in July this year. This 1585 edition, with its splendid frontispiece, bound in mottled calf with gilt turn-ins, will join other early editions of Tusser’s work in our collections, including editions printed in 1672 and 1812. 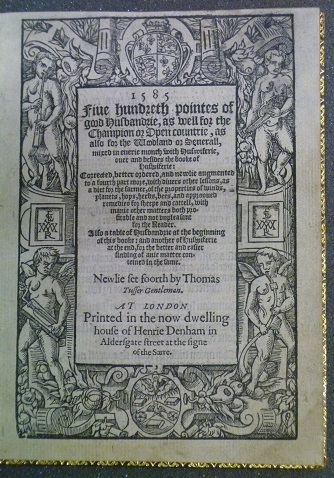 The first edition of Tusser’s work was published in 1557. 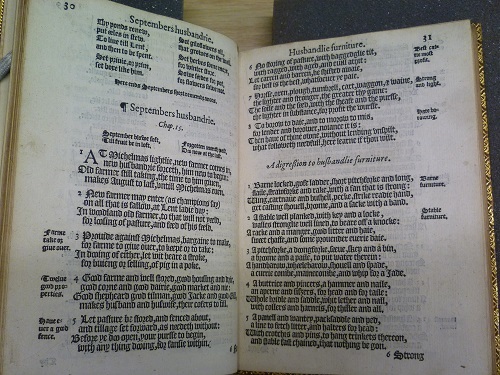 We were particularly delighted that one of our students, Amy Thomas, was able to make immediate use of the new acquisition and our other editions of Tusser’s book in her research. Amy has been working on a Undergraduate Research Opportunities Programme (UROP) project entitled ‘How To Be Rural: Agricultural Instruction in the MERL collections’, examining forgotten agricultural manuals and countryside ‘how-to’ books from the MERL library collections. Thomas Tusser was a musician, farmer and writer who lived in the sixteenth century. He was born in Essex in 1524 to a family with gentry status. He was blessed with a singing voice good enough that he was sent to Wallingford to be a chorister, and later to St. Paul’s Cathedral where he made connections and friends. He was educated at Eton, and later at Cambridge. He spent ten years at court working as a musician for Lord Paget during King Edward VI’s reign, but left after ten years to go back to farming. He tried to farm three times but with each failure he went back to his music career. He married twice in his life and had children with his second wife, Amy Moon. He died in a debtor’s prison in 1580. While Tusser was not a successful farmer, his book about farming was. His didactic poetry is said to be the beginning of the English rural didactic tradition, a tradition that has continued since in a variety of forms. 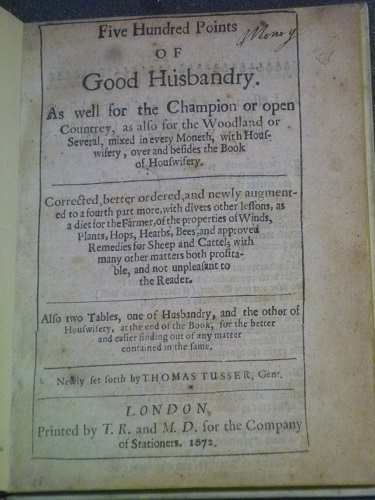 A Hundred Good Points of Husbandry was expanded to Five Hundred Points of Good Husbandry in 1573,with five editions being published during Tusser’s lifetime. His book has continued to be published throughout the centuries, one of these editions was revised by Dorothy Hartley and published in 1931. Hartley’s notes and correspondence suggest that she was planning an illustrated version of Tusser’s work based on her own research. She planned to have a frontispiece of Tusser’s farm as it was, and what seem to be a chapter of comparative images of the twentieth century and the sixteenth century. There are sketches in Hartley’s collection at MERL showing that she was working on a calendar based on Tusser’s work. She had done sketches for February, March, April, August and November. Three out of the five sketches depict women carrying out farming tasks. Why did Hartley draw women in her sketches? It could be because she was a woman, but Tusser himself included A Hundred Good Points of Housewifery in his book which compliments the housewife and her work with reverence. He even said, “take huswife from husband, and what is he then?” His writing praises domestic harmony and family while also showing that he expects a wife to work too. Another book in the agricultural instruction genre that has gender inclusive illustrations is A Book of Farmcraft by Michael Greenhill and Evelyn Dunbar. Michael Greenhill was 25 years old in 1941 when A Book of Farmcraft was written. He was an agricultural instructor at Sparsholt Farm Institute where land girls were trained. Evelyn Dunbar was a war artist who focused on depicting the efforts of women on the home front. She spent some time at Sparsholt to draw and paint the land girls’ training. Greenhill saw Dunbar’s art and how the land girls often did things wrong and thought they should write an instructional book together. A Book of Farmcraft was acclaimed for the use of teaching newcomers how to farm in a time when unskilled farm labour was needed. All our editions of Tusser’s work are available to view through the Special Collections Service reading room.